One of the largest breast-cancer prevention studies ever completed shows that taking a common osteoporosis-prevention medicine can reduce a post-menopausal, high-cancer risk woman's chance of developing invasive breast cancer by 50 percent, the National Cancer Institute announced Monday. The striking results come from a five-year, 19,797-participant trial, referred to as STAR: Study of Tamoxifen And Raloxifene. The former has been used to prevent cancer, but has rare-but-serious side effects, such as blood clots and reproductive tract cancer. The later is currently used to prevent and treat osteoporosis in postmenopausal women. "Tamoxifen has been the standard treatment to prevent breast cancer in women who are at increased risk for the disease," said CBS News' medical correspondent Dr. Emily Senay. "Now a drug that is used to treat osteoporosis has been found to be as effective in reducing the risk of breast cancer as tamoxifen but that is has fewer side effects such as uterine cancer and blood clots." Initial Results of the study show that both drugs reduced the risk of developing invasive breast cancer by about 50 percent. Within the study, women who were assigned to take raloxifene daily, and who were followed for an average of about four years, had 36 percent fewer uterine cancers and 29 percent fewer blood clots than the women who were assigned to take tamoxifen, CBS News correspondent Elizabeth Kaledin reports. The new results suggest that raloxifene may supplant its older cousin as the first choice for breast cancer prevention in postmenopausal women at high risk of developing the disease. "Now women have a choice," Dr. Leslie Ford, NCI's cancer prevention chief, stressed in an interview Monday. "It's good news, because we're giving you a choice with fewer side effects." Dr. Marisa Weiss, the president and founder of breastcancer.org told CBSNews.com that chemically, raloxifene and tamoxifen are very similar. "They only differ in a few ways, but were used for different purposes," Weiss said. "It was sort of serendipity that they decided to do this study," because it shows that raloxifene is a good choice for post-menopausal women who are at high risk of developing breast cancer. In the online chatter of breast-cancer message boards, such as that on the Susan J. Komen Breast Cancer Foundation site, scores of women to whom doctors perscribed tamoxifen expressed emotions ranging from skepticism to fear of the potentially serious side effects of the drug, CBSNews.com reports. "Now I'm real hesitate to start the Tamoxifen. I have concerns about the hot flashes and it was suggested an anti-depressant to counter them. I don't want to take another pill!!!!" a poster who called herself Jennifer wrote. Other message-board users said they'd taken tamoxifen for years with no noticable side effects. One poster who called herself Anne wrote: "I've taken tamox for 2 and a half years with very mild side effects (hot flahes and insomnia; both manageable). Manufacturer Eli Lilly & Co., which sells raloxifene under the brand name Evista, plans to seek Food and Drug Administration approval for the new use. Until now, tamoxifen has been the only drug approved to reduce the chances of breast cancer striking high-risk women. It's a multiple-use drug: It acts like the estrogen hormone in some tissues, but like an anti-estrogen in others. Estrogen can fuel certain breast cancers, making tamoxifen a longtime top choice both to prevent the disease's return in women with estrogen-sensitive tumors and to reduce the odds of it striking high-risk women in the first place. But tamoxifen causes some rare but serious side effects: It acts like an estrogen in the uterus and bloodstream, thus increasing users' risk of getting uterine cancer or a life-threatening blood clot. Raloxifene is a close chemical relative, in the same drug family known as "selective estrogen response modulators," and earlier research suggested that it might help breast cancer, too. So the NCI launched the $88 million study to compare the two. 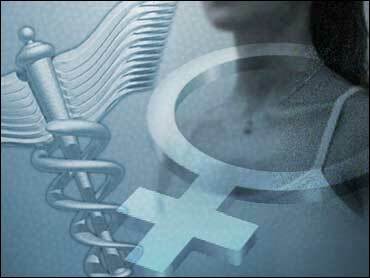 Taking either of the drugs daily cut in half women's chances of developing invasive breast cancer, NCI announced Monday. The trial was coordinated by the National Surgical Adjuvant Breast and Bowel Project, and was sponsored by the NCI, part of the National Institutes of Health. Raloxifene causes the same side effects, but not as many: Raloxifene users had 36 percent fewer uterine cancers and 29 percent fewer blood clots, the initial results show. "One of the big deal-breakers for putting women on tamoxifen was the uterin cancer risk. Women would say, 'wait a minute, you're decreasing my risk for one cancer but increasing it for another?'" Weiss told CBSNews.com. Some 2 million U.S. women every year are thought to be candidates for tamoxifen risk-reduction therapy, but many have avoided it for fear of those side effects, said Dr. Kathy Albain of Loyola University, a researcher in the new study. "Here we have something that's a little less scary," she said of the raloxifene findings. "It might tip the scales for a lot of women." The new study means no change for premenopausal women — there's no data showing whether raloxifene is safe for them, Albain stressed. Nor does it mean that tamoxifen users should necessarily switch, she said. Women currently are prescribed tamoxifen for five years, and its breast cancer prevention benefit continues even after they stop taking the drug — as raloxifene's seems to. So a woman already in, say, year 4 of her tamoxifen course with no sign of side effects probably has little to gain by switching, she explained. Still, that's a question researchers were girding for as they spent Monday notifying study participants of the results. Among postmenopausal women, who's at high risk? NCI defines it as someone with at least a 2 percent chance of getting breast cancer within five years — because of advanced age, a close relative with the disease, never having a child or having one late in life, or other well-known risk factors that women can calculate on a government Web site. And there remains no magic bullet, Weiss said. "This is just one of a number of things that one should consider doing," including eating a low-fat diet and exercizing regularly, Weiss said. Most of the study participants actually had a far higher risk, Ford said: For every 1,000 of them, doctors expected 40 to develop breast cancer within five years if they did nothing. Taking one of the drugs cut that number to 20 instead.